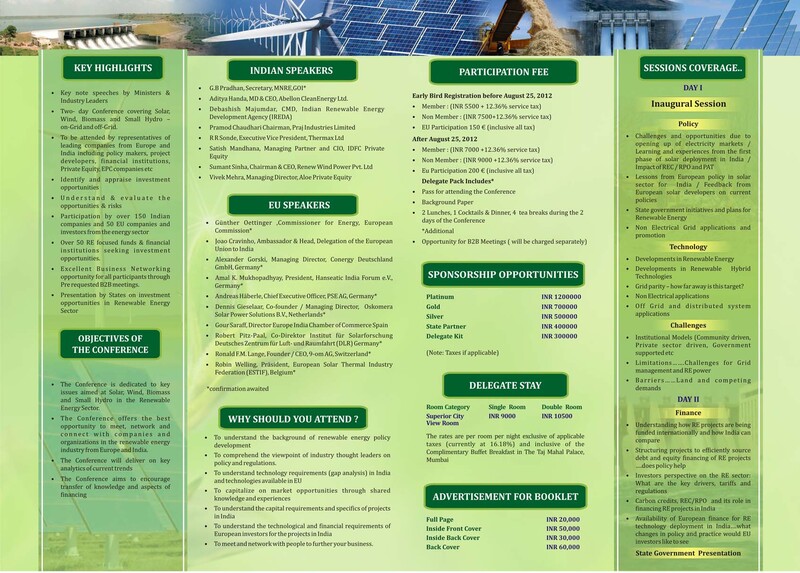 Chamber partnered and promoted the upcoming Renewable Energy Conference was held in Mumbai on September 25 & 26, 2012. The conference was jointly organised by the Council of EU Chambers of Commerce in India and European Business and Technology Centre (EBTC). The main theme of the Conference was Renewable Energy – Policy Regulation Technology & Finance. The Conference was supported by Ministry of New and Renewable Energy, Government of India and Government of Maharashtra and General Carbon Advisory Services Pvt. Ltd was the Carbon Offset Partner for the Conference. 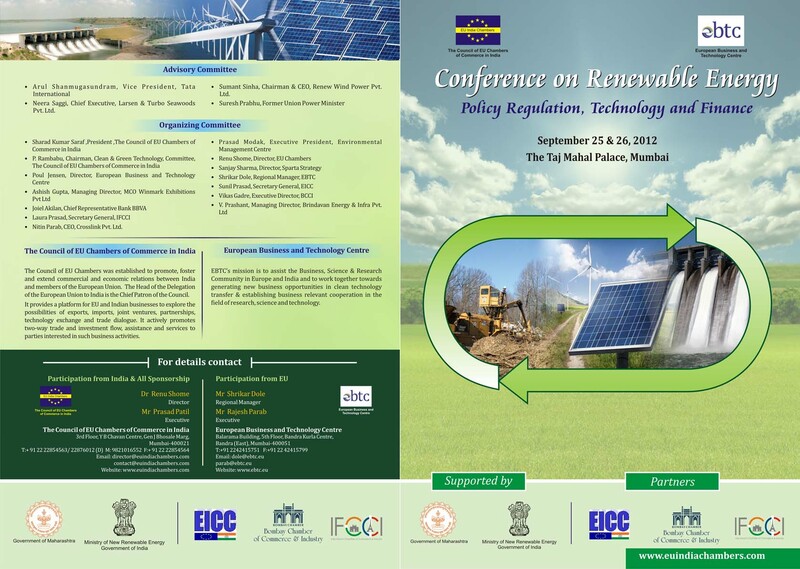 The Objective of the Conference was to deliberate various aspects of renewable energy Policies/Regulations in India and Europe, Experience in financing renewable energy projects, Revenue streams for Renewable Energy Projects viz., Feed in tariffs RECs and Carbon Credits and to promote EU experience and technology transfer to India in Renewable Energy Development The Conference aimed at providing a platform for power providers, technology suppliers, investors, industry experts as well as political and economical decision-takers to ensure a sustainable development of India’s energy and environmental ecosystem looking for technical support from European companies. EICC partnered the event, because the conference was the prominent networking event for producers, developers, utilities, manufacturers, suppliers, large energy consumers, investors & lenders, and governments. The Conference brought together 150 delegates and speakers from the power and renewable energy sectors from EU and India including policy makers, renewable energy experts, debt and equity investors, EPC companies, consultants, equipment suppliers and manufacturers of eco-friendly technology. The two day conference promoted a dialogue on policy deployment that will be conducive to further catalyze renewable energy development in India with increased participation of EU technology and finance besides evolving an understanding and matchmaking of relevant businesses across EU and India. The Conference aimed to encourage transfer of knowledge, technology and finance amongst EU and India for renewable energy development. The conference also provided ample opportunity to developers from India to network and interact with technology and finance providers from the EU. Key highlights of the Conference include: attendance by representatives of leading companies from Europe and India including policy makers, project developers, debt and equity investors, EPC companies etc; deliberations on the current & future potential in Renewable Energy sector & development in Policy and Regulation; identify and appraise investment opportunities; understand and evaluate the risks; assess the regulatory & reform pattern; excellent Business Networking opportunity for all participants through Pre requested B2B meetings. For more details and other enquiry, please contact EICC (info@eicc.be) or EU Council of Chambers in India (director@euindiachambers.com)”. EICC, as Europe’s Apex trade and business body, accepted an invitation from the Institute of Directors, India to join as Associate Partner for the Global Convention 2012 to be held in London on 10 -12 October 2012. The theme of the Convention was Corporate Governance Perspectives & Sustainability Challenges. The Flemish government hosted the Global India Business Meeting 2012 in Antwerp, the city of diamond on 24-25 June 2012. Over 300 business leaders representing multinationals, large corporations, small and medium-scale enterprises and confederations, multilateral and regional institutions from Europe and India were gathered in Antwerp for a two-day meet to boost trade and economic links. The summit was aimed at strengthening the Belgo-India trade and economic relations and offer opportunities for business collaboration in the two countries Although it was hoped that the global economic situation will improve in the follwoing few months by the time the event was held, the business summit however took place in the midst of global economic uncertainty, ever unfolding Eurozone economic crisis and challenges faced by Indian business leaders on doing business with Europe. The summit therefore assumed special significance as to how Indian and global business can join together to avoid economic recession and how global business leaders address this challenges. This was the fourth such meeting being organised by Horasis focusing India, and was indeed one of the most important trade and investment events outside India. Europe India Chamber of Commerce (EICC) was the key collaborator of the Horasis event and coordinated relentlessly and vigorously with Flanders Investment and Trade and other local Chambers.